Black LED dance floor for Corporate event. We send feedback forms to every client after their event to monitor and improve our services and ensure we are performing to our best. We love to share these with you to reassure you of our dedication to supply a quality service and products each and every event. Just wanted to send you an email to say a big thank you for supplying the dance floor for our wedding. It looked amazing and the guests loved it - it came out brilliantly on the photos too!! Thank you for all of your help in making our event such a great success. 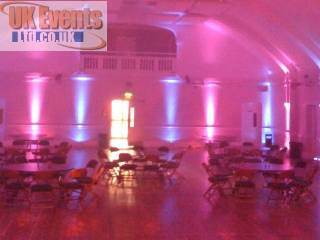 The uplighters completely transformed the room and looked just amazing. Everything went like clock work, your mobile night club with LED white floor was just the best ever and when it was revealed during the evening for the first dance, no one could believe their eyes (including me as I had not seen it lit up), it was just incredible. Actually it brought tears to my eyes it was so perfect. Just a quick note to say thank you for all your efforts on our behalf at SCB yesterday/this morning.They both went down very well and from what I can understand was a first in those rooms. . Look forward to doing business with you again. I can't put into words how fantastic the black dance floor looked at our staff Christmas party. It made all the difference. 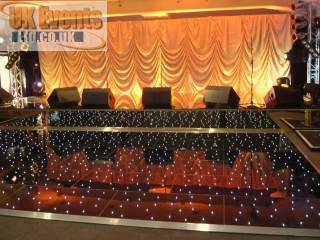 Excellent service at such short notice - Very helpful and staff on the night were excellent loved the set up loved the music will definitely use you again. Just a little note to thank you for setting up the dance floor for our wedding reception on the 1st May. It definately bought the evening to life and made our first dance even more special. This was a last minute addition to the wedding and we were so pleased we went ahead with it! Thanks again for setting up and arranging this so efficently. Our event was very last minute and from the moment I called UK Events to make my initial enquiry, to the moment they collected the hired equipment I received nothing less than first class service. I will without any doubt use UK Events again. Thanks to everyone for helping us to	make our party the success that it was. 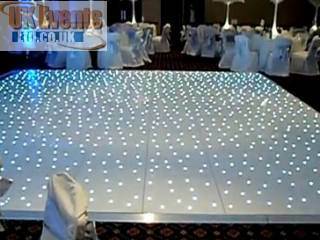 Great dance floor and a pleasure to deal with your company. Everything went smoothly. Thank you very much! Just wanted to say everything went really well and the dance floor looked great. Hope we can use you again soon. 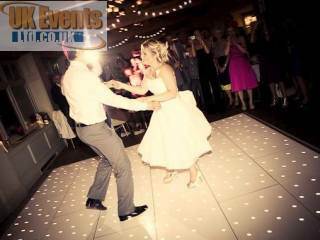 The overall experience dealing with your company and staff was excellent and the dancefloor provided was exceptional and all at an excellent price. Highly recommend and will certainly use in the future and pass details on to friends. I just wanted to say thank you for your support of our event on Wednesday 4th March. Chris was prompt on both drop off and pick up.